The FP7 UK ICT National Contact Point and the ICT KTN are pleased to invite you to join this event and will help you to understand the call contents and the support available to proposers from ICT KTN and elsewhere. 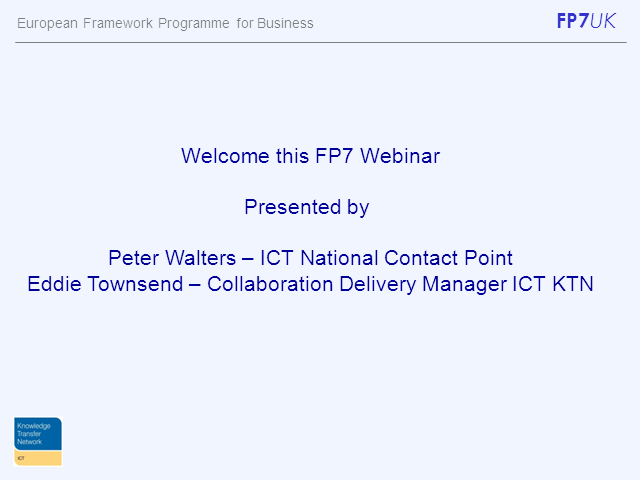 The webinar will be presented by Peter Walters UK NCP, and Eddie Townsend, Collaboration Delivery Manager ICT KTN. The webinar presentations will last for approximately 40 minutes followed by a further 20 minutes for questions. This event is part of an ICT KTN programme designed to assist UK organisations benefit from the Framework programme and leading edge research networks. Peter Walters UK NCP, and Eddie Townsend, Collaboration Delivery Manager ICT KTN. Presented by: Peter Walters UK NCP, and Eddie Townsend, Collaboration Delivery Manager ICT KTN.